The market value of LED lighting has continuously expanded in the past years with the progress of the technology. According to the latest report of LEDinside, LED lighting market scale will reach US$ 33.3 billion in 2019 and LED lighting market penetration will come to 63 percent in 2022 from 22 percent in 2017. The increasing market of LED lighting has attracted numerous companies to enter. The improvements in technology also helped to reduce the producing cost while enhancing the efficiency and operational life time of LEDs. These factors have thus led to fierce competition between LED lighting manufacturers, resulting in a dramatic price drop of LED lighting products in the past few years. The falling prices have eroded the margin of industry players. 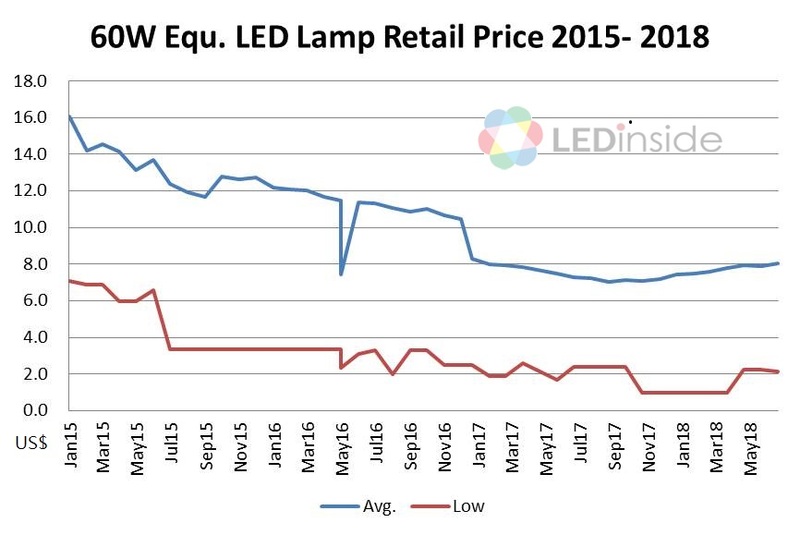 LEDinside has been tracking the street prices of LED bulbs. The data collected during January 2011 to July 2018 shows that the average price of 60-watt equivalent LED products has dropped from around US$ 45-50 in January 2011 to below US$ 10 by July 2018. 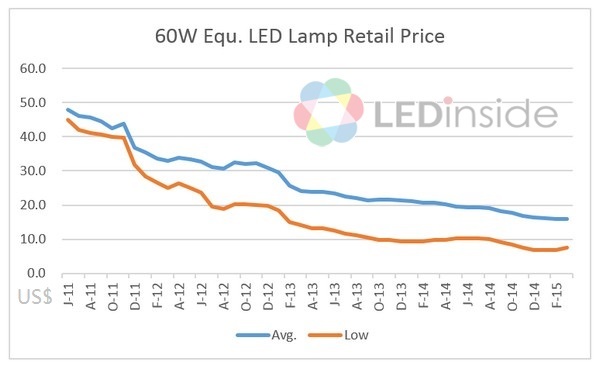 The current price for LED lamp product is only one fifth compared to the price seven years ago. The profit of producing LED lighting products has therefore become flat for lighting manufacturers. International lighting manufacturers have amended their operation strategies or reorganized the business. Osram has completed the sale of its offspring, LEDVANCE to a Chinese consortium consisting of IDG, MLS and Yiwu and announced to sell its luminaires business earlier this month, while GE has gradually closed its lighting sales in different regions and might sell the lighting business to Chinese buyers. Chinese lighting manufacturers, with a foothold on Chinese market and the advantages of manufacturing cost, have accumulated the capability to enter the international market. However, with the falling price of LED lighting products plus the tariff imposed on them which will come into effect by August 23 due the current trade war between China and the U.S., the lighting manufacturers might encounter more challenges.